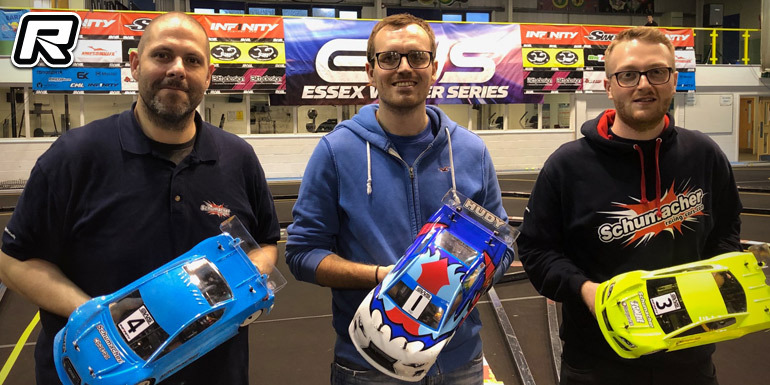 This weekend saw the fourth round of the popular Essex Winter Series take place in the UK. As the penultimate round of the series, some of the championships could be decided, but with the high level of competition across all the classes, it was going to be a tough day for everyone in the points chase. 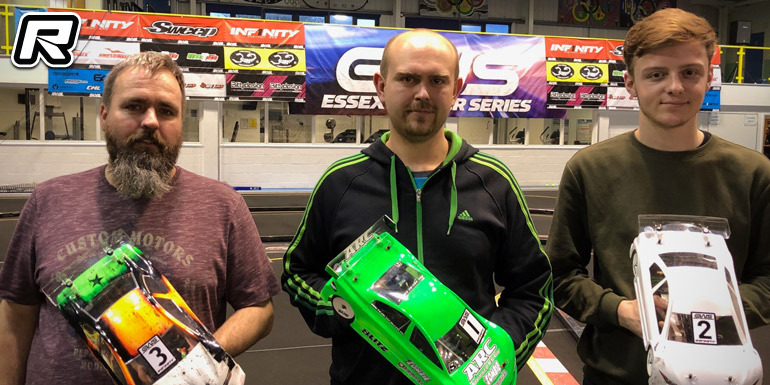 In the Modified class, Olly Jefferies ideally needed a maximum points haul to force a showdown for the final round – but Elliott Harper could clinch the championship with a runner-up score, if Olly failed to take home the maximum points. Elliott put together a good first run, taking the top spot by nearly two-and-a-half seconds from his Xray teammate Alexander Hagberg. Olly set the third best time, just a few tenths back on the Swede, with Kyle Branson in fourth for Capricorn and Matthew White taking fifth with his Associated. 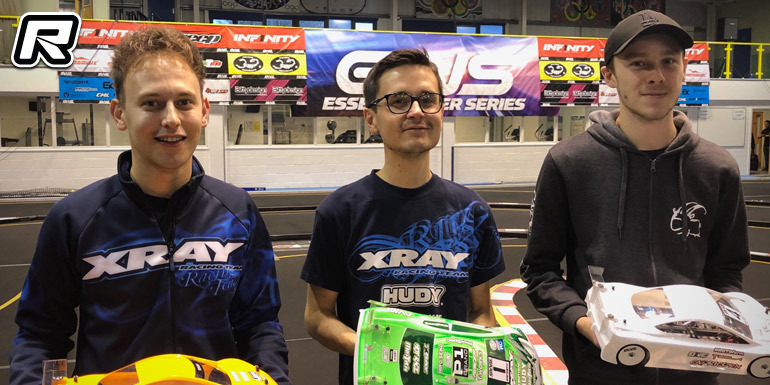 Round two saw Alexander move to the top, besting his teammate by three-quarters of a second, as both the Xray drivers pulled out a two-second gap to Olly, who again took third, with Kyle and Matthew in fourth and fifth again as well. Round three saw it decided that an Xray would sit on pole position, as Alexander beat Elliott by a few tenths again, meaning only these two would start out front for the A-final. Once again, the remainder of the top five was identical as Kyle and Matthew put in consistent runs and joined the top three in setting 21-lap runs. The final qualifier saw Elliott and Alexander exchange the lead a number of times, until later in the race Alexander managed to open up a slight gap – once again, just a few tenths separating the Xray drivers but Alexander setting the best time and thus securing pole position. Olly was again third, with Chris Grainger moving his Associated into fourth to leap-from Matthew on the starting grid. The A-final got away with Elliott potentially five minutes away from wrapping up his fourth EWS Championship – he would need to hold second in the race and keep title rival Olly behind him. However, things became a lot easier for Elliott as Olly rolled his Schumacher in just the second corner, leaving his car on its roof and dropping him to the back of the field. With the threat behind removed, the top two starters had a fantastic race-long battle, the gap never more than one second as they continued to pull away from the field. Behind, Olly slowly picked off places to move up, but realised his work was cut out for him to prevent Elliott securing the title after that early mistake. Kyle, Chris and Matthew circulated in third, fourth and fifth, with no one able to get close enough to think about any attempts at a passing move, until Chris rolled his car in the final minute of the race, dropping him down the field and allowing Matthew into fourth. Meanwhile, Olly had worked his way up to sixth, behind the Yokomo of Harley Eldridge. Harley did a great job holding off the multi-time UK champion, but his experience finally showed through after a great pass on the very last lap moved him up to fifth. Out front, the leaders came around to lap the field on the final lap, Elliott possibly sensing a chance as they worked through the traffic – but Alexander held his ground to take his third ever win at EWS, with Elliott finishing second but taking home enough points to wrap up the championship title with an event to spare with his 19th podium finish at the UK’s most popular on-road series. Over in the Super Stock class, Zak Finlay had the chance to also take home the title, but the maths there were more complicated and depended on a number of other results. Tony Broad, a former EWS Champion but recently finding himself the “bridesmaid but not the bride” got proceedings underway with the quickest time, ahead of Belgian star Florian Joos, once again making the long trip over to compete in the UK. Zak took third in the round ahead of R2 victor Colin Jackson and his teammate Darren Lee. Q2 saw Florian take his Xray to the top of the time sheets as he continues to make a name for himself in the RC world. Tony took his privateer Xray into second this time, with Zak’s Schumacher in third and Darren’s ARC fourth. This time Marcus Askell, one of the contenders for the Masters (+40) title, took fifth for Schumacher. 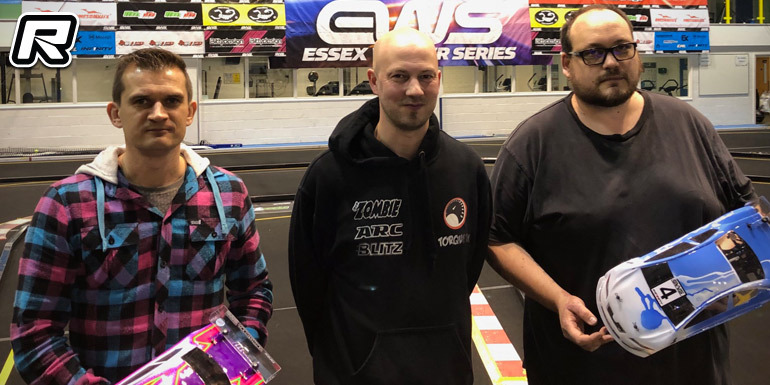 In the third qualifier, Zak took a step towards the title with a TQ run, with Tony second and Daniel Blake (Xray) third in front of Colin and Darren. The last qualifier would then set the grid, and Tony returned to his earlier form with a neat and clean run to set the best time so far and secure the number one grid slot, with Marcus in second, James Hart (Schumacher) third in the round, Zak fourth and Awesomatix pilot Ashley Wiffen fifth to lock himself into a competitive A-final. Zak could still secure the title, but would need to win from his third place grid spot. The start didn’t go Zak’s way with Florian, from second on the grid, making a mistake on the opening lap and collecting Zak. This allowed Marcus up into second, as Zak recovered in third and Florian in fourth. The top four quickly separated themselves from the field and left the others to scrap over the minor places. Tony looked in control, opening up a decent gap as the fight developed for second, third and fourth. But with three very evenly matched cars and drivers, position changing looked unlikely. A few times, Zak was able to break away from Florian and begin to challenge Marcus, but each time it seemed he ran out of steam and dropped back a little. After five minutes of intense racing, Tony ran out the winner, with Marcus securing second in front of Zak and Florian, meaning the championship would be decided at the finale in March. This result also maintained Zak’s remarkable run of thirteen consecutive podium finishes at EWS, stretching back to November 2016. 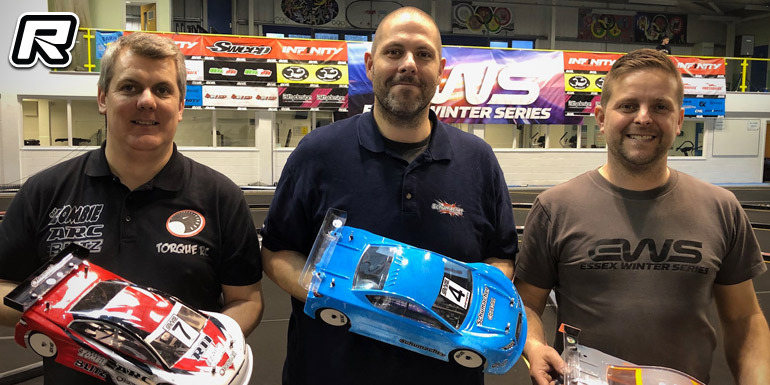 The Amateur Stock class has featured a different winner at every event so far, and the close racing by the un-sponsored drivers with handout Muchmore 17.5 motors looked set to continue. Jonathan Gibbs set the best time in Q1, ahead of championship leader Billy Kavanagh and crowd favourite Shane Chipolina. The second round had Matthew Booth out front, with Billy second and Jamie Murray, winner last time out, in third. Round three also went the way of Matthew, Samuel Jones took second and Billy continued his good run with a third top-three. The last qualifier had Samuel setting the fastest time ahead of Billy, but Matthew’s third was enough to secure him the overall TQ. The A-final saw more close racing as everyone had expected, but it was Matthew who stamped his authority on the class this time, opening up a small gap in the first few laps and allowing everyone else to fight for second place. As the five minutes ran down, Billy Kavanagh kept himself as the title favourite as he came through to take second overall. Behind, Shane looked on track for another great podium result, until Samuel slipped through to third on the last lap, having dropped down the order earlier on from his second place starting spot and had to work his way back through the field again. Inside the Super Stock class, the sub categories for Sportsman and Masters were also was competitive as ever. The Masters class saw three drivers making the A-final, and Marcus Askell’s second overall saw him the top +40 driver, ahead of Darren Lee (6th overall) and Richard King (10th overall). In Sportsman, Rob Brighton was the best this time out, finishing 5th in the C-final, ahead of Adam Spencer (8th in the C-final) and Stephen Smith (3rd in the D-final). But, with two C-final finishes this year, Adam now finds himself bumped up from Sportsman, meaning the overall title is wide open going to the season finals next month.